We have a new winner of the Men's Veteran category. The team of John Havranek, Scott Enfield and Robert Wildig were classfied as an Open team, but having lost their youngest team member before the start, they have been re-classified as s Veteran's team and placed first in that category. Congratulations. This 6 hour event is located at North Wahroonga with a mass start at 9:30 am. 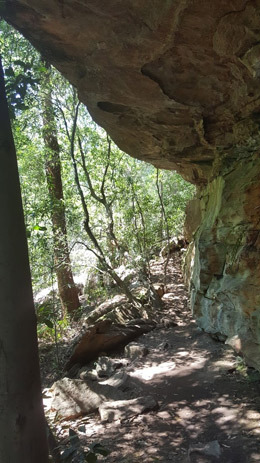 The NPWS requirement to stay on the bush trails not only protects the local flora, but also makes the event ideal for novices and families - as well as trail running enthusiasts. Yesterday’s Socialgaine was a great success, thanks to the significant efforts of the team of volunteers that helped bring it all together. Big thanks go out to the course setter Lee Coady who came up with a great location and course and was meticulous in making sure that all tracks were on the map and that all the controls balanced with mathematical elegance. The vetting team of Lisa Gyecsek, Monica Wong and Brett Lansley who checked and fine-tuned the course and map. Graham Field for putting the map together. Event coordinator Martin Dearnley, who did all the background admin, then a great job on the PA at the start and end. Lee’s intrepid team of flag hangers included (side from Lee), Tim Keighley, Emily Goldstiver, Amanda Parker and Amanda Hudson who all put in a big day on Saturday to get all the controls out there in time for the event. Robin Cameron for collecting the flags, starting just after competing on Saturday! Anita Bickle for working admin for the day in the usual unflappable style and Chris Stevenson for getting the results up, post event and on the web so quickly. Duncan Cross – who towed the Admin trailer up to the event and Mark von Huben for towing it back. Keith Fone and the team from Waitara Scouts for the fine cuisine at the end of the event. A very special thanks also goes out to Tim Keighley and Tina Woollard who both put in a solid day at the Hash House helping make things happen. Our sport depends on the continued efforts and support of our volunteers. Thanks again for making this event a safe and rewarding experience for everyone. Hewn from surrounding bush sandstone by 5756 Pte. W. T. Shirley as a memorial to fallen A.I.F. comrades, the Sphinx is approximately 1/8th the size of the Great Sphinx, located on Egypt’s Giza Plateau. Pte. William Shirley was a patient of the Lady Davidson Hospital (the Webmaster worked here for 6 years) for returned World War One Australian veterans. He sailed to war in January 1916 and served with the 13th Btn A.I.F. (the “Two Blues” – as a result of the Battalion’s two tone blue colour patch). Like many of his comrades at Lady Davidson he suffered from gas inflicted during the fierce battles on the Western Front - with the added complications of a tuberculosis infection. Between 1926- 1928, an ailing William Shirley laboured at creating his personal memorial to his fallen A.I.F comrades. The Sphinx took some one and a half years to complete. He died in 1929, leaving an unusual legacy in stone to be contemplated by the many bushwalkers who enjoy the Ku-ring-gai Chase National Park.